Kelly all set for Vespa riding! 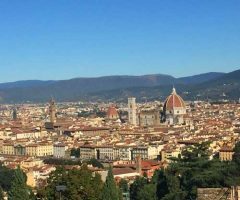 But after you’ve climbed to the top of the Duomo and studied the city below, placed all the landmarks and turned your gaze to the lovely green hills surrounding you, don’t you long to see what lies beyond the ancient Roman walls? I know I did! And what better way to take a quick break from the busy streets and get out of town to explore the countryside for a few hours, than on a Vespa — an ultimate icon of Italy. 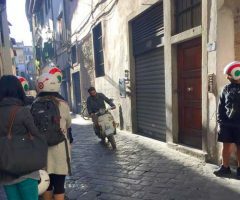 While I researched renting a scooter on my own, I thought it best to have my initial experience riding a Vespa in Italy be with the security and ease of a guided tour. I’ve often used the Viator app on my phone to find great adventures and after viewing a number of options, I decided on booking the Florence Vintage Vespa Tour of Tuscany. It turned out to be a great choice. When you arrive, they will spend a little time having each person ride one of the Vespas up and down their alley to assess your ability. Not to worry, if you can ride a bike, you’ll be fine! If they deem you a bit too shaky, you can opt to ride as a passenger with the tour leader in his vintage Fiat and still see the sights. So, helmets on and off we scooted! There were 10 people in our group ranging in age from about 25 to 65 and all were equipped with two-way radios in case we got stuck behind traffic and missed a turn. But that was never a problem as our guide, in his little Fiat, did a terrific job making sure everyone stayed together. We really didn’t spend much time riding around the historic center of Florence, as the itinerary focused on getting us out into the surrounding Tuscan hills….perfect! 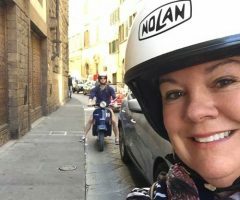 We headed out like ducklings following their mother, over the cobblestone streets and across the Ponte alle Grazie…what a thrill to be on a Vespa, riding across the Arno on a beautiful sunny morning. You can see, feel, smell everything so much more intimately. We continued through the pretty San Niccolo neighborhood and up Viale Michelangelo and passed the crowded Piazzale Michelangelo in favor of our first stop higher up at the 1,000 year old San Miniato al Monte basilica. With its extraordinary views and one of the finest Romanesque structures in Tuscany, it was a lovely first stop and we had ample time to view the church. Then off we went, everyone now feeling very comfortable on their vintage steeds, and enjoyed another hour riding through the hills and small villages before stopping, off road, at a vineyard where our guide informed us about the area, the vines and local wines. Then more carefree riding down winding roads, passing villas and hamlets and reveling in the beautiful scenery on our way to lunch al fresco at a hillside estate owned by “Mr. Walkabout”. 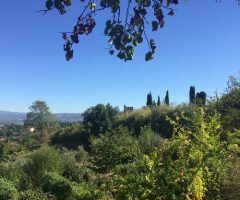 This estate also hosts their cooking classes and has a marvelous terrace built into the hillside with outstanding views out over the valley. 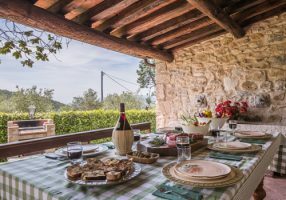 Lunch was delicious, leisurely and typically Tuscan with bruschetta, fresh pasta, cheeses and charcuterie…and Chianti wine, but only a glass for the drivers…no overindulging while riding the Vespas! The last hour or so was spent meandering back into Florence, soaking up the sun and glorious views around every corner. It was a lovely and relaxing way to see a bit of Tuscany from this vantage point…and did I mention it was fun? It really was tremendously fun! If I sound enamored of my vintage Vespa tour of Tuscany I am! It was one of the highlights of my time in Florence, and I plan to do it again, or possibly even venture out and rent a Vespa on my own! Thank you for sharing your experience, and most of all this great recommendation for riding Vespa in a group – makes it more safe! I had been driving to these hills to find some beautiful views of the city, although being behind the wheel (and not in a convertible, what a mistake I know!) was not the best option as one has to deal with the map, the views at each bend, the limited parking and these Vespa riders! Thanks for your comments Gilbert….and yes, you should jump on a Vespa the next time you’re in Florence, you’ll enjoy it!